It's Friday, and everything around you has stopped making sense. Oprah is ending her talk show. Ace Ventura has a married daughter. Someone's trying to drag you to New Moon. 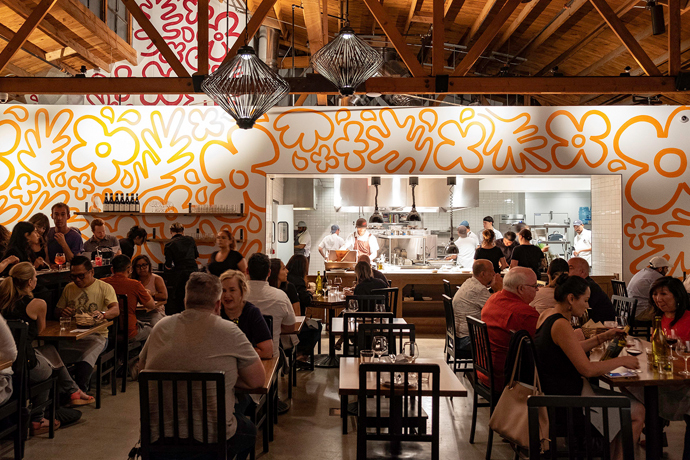 Which means you're in the perfect state of dazed bafflement to enjoy a colorful spectacle like Tangier Korean BBQ of Tokyo, now open in Los Feliz. Let's just make something clear right away—this is not the place to impress your boss, or pitch your stately Churchill biopic, or propose to your true love (unless you two met at Comic-Con). No, this is for those nights when, for whatever reason, you decide you need to drown yourself in sake amidst a blinding blur of LED lights, floral motifs, sizzling self-cooked Kobe beef and the occasional blue robot. And you'll have plenty of places to do it—the tables up front are a bit more restrained, so if you're feeling pedestrian-friendly, grab one by the window. (Little Dom's and its deli are right next door.) Further back are sturdy booths and the larger main room—and a large stone-cloaked patio will open in a few weeks. You can grill your own meat on the tabletops, or summon some drinks and cheap sushi rolls. That slug line, "Korean BBQ of Tokyo," isn't introducing a stunning fusion mash up so much as conveying a playful, anything-goes mishmash.